The landmark downtown Joske's building this year could see the start of construction that would return retail to the space for the first time since 2008. The New York-based company that owns Rivercenter mall plans to divide the department store space into smaller retail spaces and restore the building's original façade. Interior demolition could start in the year's second quarter. “We hope to start construction midyear and be 70 percent leased at that time,” said Joe Press, senior vice president of Ashkenazy Acquisition Corp.
Ashkenazy also will remake the Blum Street pedestrian corridor between the mall and the Menger Hotel into a set of “fast casual” restaurants with outdoor cafes. “It will be like a promenade,” said Michael Alpert, president and vice chairman of Ashkenazy. And as soon as it signs a lease with a new tenant, it plans to continue renovating the lagoon area of the mall to add more upscale restaurant space, similar to the Brazilian steakhouse Fogo de Chão, which opened in 2009. The changes will help move the mall more in the direction of being an entertainment and dining hub, aspects considered more important at Rivercenter than at traditional suburban malls. But general manager Chris Oviatt said the mall must continue to balance the retail and dining needs of local shoppers (about 45 percent of mall customers) while serving the 55 percent of its visitors who come from outside Bexar County. “It's not a large mall in terms of leasable space. We have to be really careful about how we segment that in terms of the type of retailing we go after,” he said. The mall has about 565,000 square feet of leasable space, and the changes to the Joske's building will add more than 100,000 to that, he said. The old Joske's is at 100 Alamo Plaza at the corner of Commerce Street and was known to generations of San Antonians as Joske's Department Store. It was most recently a Dillard's department store, which closed in late 2008. Design and construction drawings are still in the works, and Ashkenazy has not started the permitting process. Oviatt said the mall hopes to have a demolition and structural permit by midyear for the Joske's building. “We want to make it a vibrant and active piece of downtown again,” he said. The building has timber frames, which need to be replaced, and too many columns for modern retail. To open up the floor space enough, the building's façade essentially will be propped up while the interior is demolished and rebuilt, Alpert said. “You won't see any of it from the outside,” he said. The Blum Street “fast casual” dining corridor would be redesigned in conjunction with the Joske's building. Some of its lagoon-area signage was approved by the city's Historic and Design Review Commission recently, the only aspect of city approval it has sought so far. Oviatt said the company is working on a master plan for mall signage to bring back to the HDRC. 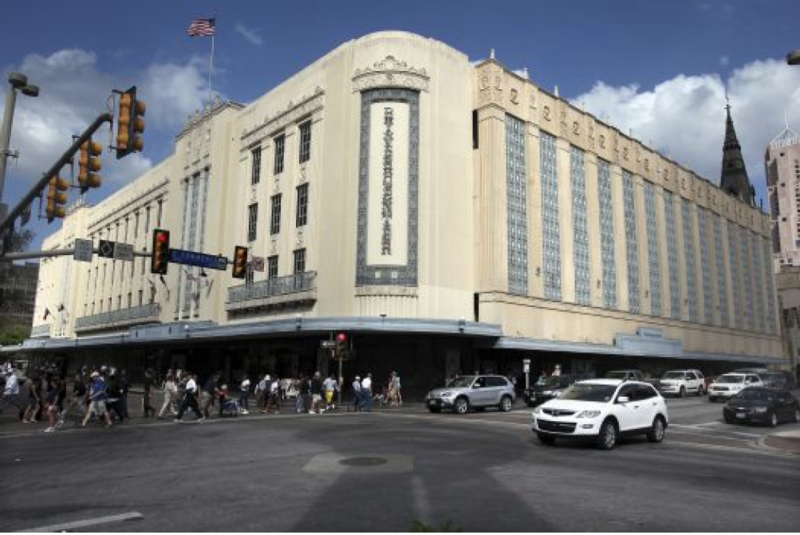 The Menger Hotel owns half of the pedestrian corridor that Ashkenazy wants to turn into “fast casual” dining, and some of its rooms overlook the area. Hector Venegas, general manager of the Menger Hotel, said he has spoken to Rivercenter officials about the plans in general terms. But Venegas hasn't seen any finalized plans. Other than noting that “they cannot affix anything to our building,” he couldn't comment on the plans. Ben Brewer, president of the San Antonio Downtown Alliance, said downtown residential rentals have been filling up quickly but that downtown could use more retailers. The old Joske's is a 1939 building that incorporated an original 1889 Joske Brothers store. The façade of the building was partially covered with a molded fiberglass screen in 1967 in advance of the 1968 HemisFair. In the late 1980s, the store was converted into a Dillard's and connected to the new Rivercenter mall, which was seen as a project that would rejuvenate downtown and help attract more locals. There have been several plans for the Joske's building by previous owners since the late 1990s, including ideas to build loft apartments or office space. New York-based Ashkenazy Acquisition Corp. bought the mall in 2005. Oviatt said the company does not discuss financing.